Dry firing is a common problem for a crossbow. It’s one of the most common reasons why crossbows get damaged early on. The Barnett Ghost 410 features an anti-dry fire safety that solves the possibility of damaging your crossbow because of dry firing. Furthermore, the Barnett Ghost 410 features a specially designed ultra-light carbon CRT. It’s not only the sturdiest on the market, it may also be the lightest. According to Barnett, this crossbow can survive 1,000 dry firings without causing any damage to the crossbow. The Barnett Ghost 410 mainly solves the vibration problem through a specially designed composite laminate. As a bonus, it also looks beautiful. To maximize firing speed, the limbs are designed in a way that it faces less air. This design helps the limbs to move 1.5% faster compared to other types of limbs. As a result, it contributes to the 410 fps shooting speed of Barnett Ghost 410. The grip of a crossbow is very important as it’s one of the biggest factors contributing to accuracy. The grip of the Barnett Ghost 410 is specially designed to be comfortable and moisture resistant. The surface moisture resistant feature helps your palm stay warm when shooting in cold weather. The grip is also designed in a way so the fingers will be away from the flight-rail, which offers a big help, especially for beginners, in preventing injury. If the weight of the crossbow is heavy and poorly designed, it can easily wear your arms sooner, which in turn causes poor aiming and shooting. Since Barnett Ghost 410 is made up of light materials, it can certainly lessen the stress imposed on your arms while shooting and aiming. Furthermore, Barnett Ghost 410 is specially designed to have its weight placed nearer the body of the shooter. One common problem of other crossbows is a quiver that does a poor job of securing arrows. 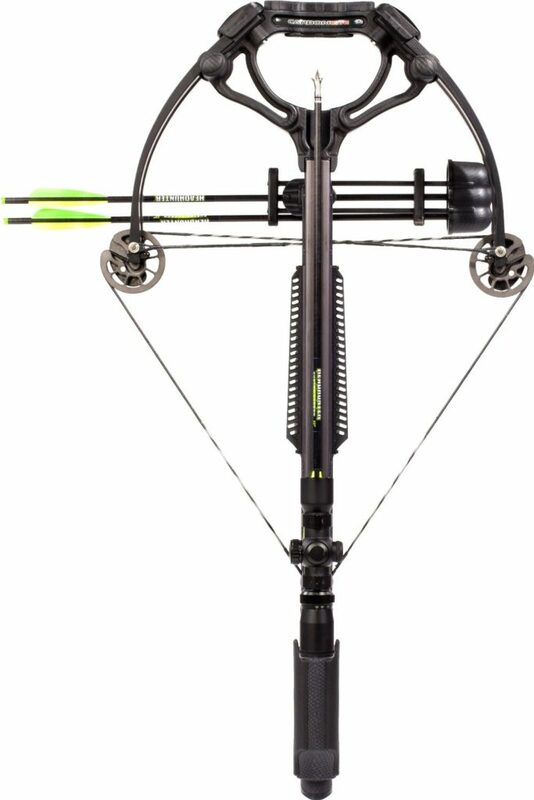 The quiver design found in Barnett Ghost 410 and the little vibration produced by the crossbow makes the quiver great at securing arrows. Barnett Ghost 410 features a large shoulder plate. This feature might seem mundane at first, but keep in mind that the shoulder plate will be pressing on you every time you aim. If it’s not comfortable, it will affect your accuracy in the long run. The shoulder design and the size of the shoulder plate result in a comfortable placement in your shoulder area. This also means that you can shoot more accurately for longer periods of time. Like any other kind of shooting-based items, accuracy is very important. To keep it simple, for a crossbow, Barnett Ghost 410 is very accurate. For one, the weight distribution of this crossbow is near perfect that aiming may be shockingly easy. The scope that comes with a crossbow is great quality. In fact, the right out-of-the-box scope can rival the performance of $200+ scopes on the market right now. All this combined feature makes this crossbow very accurate even if it’s your first time handling a crossbow. 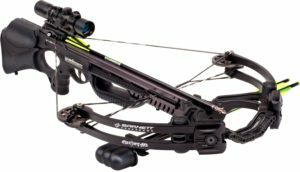 With this crossbow, you have a good chance of hitting 2″ circles for more than 60 yards with only a couple days of shooting practice. Shooting speed of this crossbow is clocked at 410 FPS and the point-blank kinetic energy measured is at 149 ft-lbs. 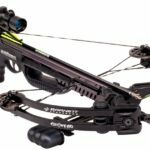 This is one of the fastest and most hard hitting crossbow’s in the market right now, especially when you consider the price. All in all, with all the great design features of Barnett Ghost 410, there is little you can say against this crossbow. It features high FPS, it is very accurate and very lightweight. It’s built of high-quality materials that it can probably last a lifetime if maintained properly. The only possible downside of this crossbow is the price tag. While it’s true that the price tag may seem steep, but when it comes to value you can be sure that you are getting more “bang for your buck”. Should you buy Barnett Ghost 410? Disregarding the price factor, there’s no reason why you shouldn’t purchase it.